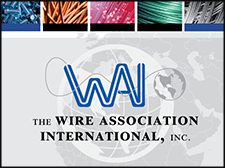 The Wire Association International (WAI), Inc., founded in 1930, is a worldwide technical society for wire and cable industry professionals. Based in Madison, Connecticut, USA, WAI collects and shares technical, manufacturing, and general business information to the ferrous, nonferrous, electrical, fiber optic, and fastener segments of the wire and cable industry. WAI hosts trade expositions, technical conferences, and educational programs. It publishes the Wire Journal International (WJI), HardWIRED, the annual WJI Reference Guide, and technical products available through the WAI Store. Highlights are below; see "Resources" for all offerings. As a WAI member you can expect to exchange ideas with like-minded professionals, experts, and pioneers in the wire and cable industry. An annual membership demonstrates support for the association that supports your career by hosting trade events, educational media, and networking forums. Member discounts apply to all WAI products, services, and event registrations. This official publication of the Wire Association is issued monthly to international subscribers in 100 countries. It is written for executives, engineers, technical and sales professionals in the wire and cable industry. It is available in print and digital formats. Updated annually and included with WAI membership, the publication is a both a buyer's guide and a reference source. It includes contact and product information about global wire and cable manufacturers and suppliers to the industry. WAI's international community of wire and cable professionals remains evergreen with a continual flux of new members who enhance the collective knowledge base. Access your peers at WAI's international, national, and local chapter events, and anytime through electronic means. If you earn a living with wire, cable, supplies, or equipment you have earned a place in WAI's global network. Introduced in 1981, Interwire is the largest and longest-running wire and cable marketplace in the Americas. The biennial exposition and networking event bring together exhibitors, speakers, buyers, sellers, sponsors, and visitors from 50 countries. WAI hosts the event in Atlanta, Georgia, USA, in conjunction with its annual meeting. This event is held biennially in a different industry hub within the U.S. Highlights include: exhibits, live demonstrations, a practical educational component, plant tours, and social events. WAI hosts the event in conjunction with its annual meeting. Free to WAI members, and also available to all, these educational broadcasts are typically one-hour segments tailored to industry specific topics with time for Q & A. Members have access to archived sessions. WAI has chapters throughout the U.S., in India, Italy, and Poland to deliver its membership experience to regional professional communities. Chapters give members a view of both local and global wire and cable industry issues through educational programs and social events at the regional level.